Australian-Russian Media gets behind Elena Gosse and Dancing CEOs. The Australian-Russian community media has rallied behind AIS CEO Elena Gosse’s fundraising efforts for Dancing CEOs – a charity event which supports Women’s Legal Service Queensland and provides free legal and welfare assistance to women and their children escaping domestic violence. Print and radio coverage has generated much interest in Elena’s campaign. As part of fundraising activities a number of traditional Russian Matryoshka doll sets were handpainted by Russian and Australian artists. Eight sets of the dolls will be auctioned online at https://www.facebook.com/ElenaGosseDancingCEO/ from 1-10 April 2016. Special thanks to Liudmila Larkina, President of the Russian Australian Representative Council of Queensland for her support and coordination of the painting of the dolls and the talented artists who donated their time and artistic efforts for a good cause. AIS Double Finalist in 18th Australian Small Business Champion Awards! Following on from last year’s (2015) Manufacturing Category win, Australian Innovative Systems (AIS) and its CEO Elena Gosse have been recognised as double finalists in the 2016 Australian Small Business Champion Awards (ASBCA) in the Manufacturing Business (100 employees or less) and Business Entrepreneur Categories. The awards acknowledge the contribution that small business plays in shaping Australia’s economic development and culture. Winners will be announced at the Westin Hotel, Sydney on Saturday, 23rd April 2016. Beautiful dolls a reminder of the ugly truth about domestic violence. Australian Innovative Systems (AIS) CEO and Access Community Services Limited (Access) board member, Elena Gosse gave up playing with dolls a long time ago but the hand-painted dolls she, and artist Ludmila Lyubushkina presented to Shannon Fentiman MP (Member for Waterford, Minister for Communities, Women and Youth, Child Safety and Minister for the Prevention of Domestic Violence) on Friday 11 March symbolised an important message.On Fri 11 March Elena will join Access Community Services’ International Women’s Week Community Lunch to be held in conjunction with the SEQ CALD Family & Domestic Violence Summit. Elena is a proud board member of Access and through her involvement with Dancing CEOs is standing up to protect women and their children from family and domestic violence.On Fri 11 March Elena will join Access Community Services’ International Women’s Week Community Lunch to be held in conjunction with the SEQ CALD Family & Domestic Violence Summit. Elena is a proud board member of Access and through her involvement with Dancing CEOs is standing up to protect women and their children from family and domestic violence. Ms Lyubushkina was invited by Ms Gosse to Access’ International Women’s Week Community Lunch as part of the successful Brisbane businesswoman’s participation in Dancing CEOs. Ms Gosse is one of 12 CEOs swapping the boardroom for the dance floor on April 15 to raise awareness and funds for Women’s Legal Service Queensland (WLSQ). WLSQ provides free legal and welfare assistance to women and children affected by domestic and family violence. Ms Lyubushkina’s artistic efforts depict women of different nationalities represented as traditional Russian Matryoshka dolls (Russian Nesting Dolls). They show that domestic violence is a worldwide issue and can affect people of any cultural background. “As beautiful as these dolls are, sadly they represent the very ugly truth about domestic violence in our communities, Ms Gosse said. 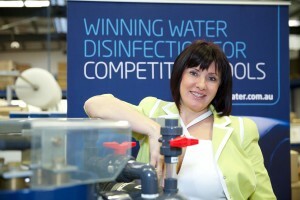 Ms Gosse who runs a successful Brisbane based water disinfection and chlorinator manufacturing company is of Russian Heritage and has been living in Australia with her husband and two daughters for over 25 years. 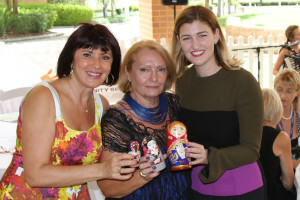 As part of her Dancing CEO fundraising efforts 10 sets of Matryoshka dolls were painted by female members of the Russian and Australian community. A selection of the dolls will be auctioned as part of Ms Gosse’s fundraising efforts with the remainder gifted to key government and domestic violence service organisations. “The Minister was very touched by the gift and the symbolism and effort behind it, Ms Gosse said. AIS’ products can be found in over 55 countries worldwide. Hong Kong based customers, Emaux recently visited AIS’ Brisbane facilities. After previously purchasing AIS’ commercial and residential systems and experiencing AIS’ innovative technology first hand, Emaux company representatives Mr Everest Chan and Mr Ben Ho were keen to learn more about AIS’ expanded production facilities and to discuss additional opportunities for AIS’ products in China. AIS CEO Elena Gosse and Director Kerry Gosse welcomed Mr Chan and Mr Ho, along with AIS’s new Production Manager, Walter Morris and Technical Advisor, Blake Pearl.